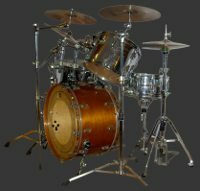 This set of drum samples was created for programming of the acoustic drumset parts in musical productions. Disc contains set of 956 wav samples(~515MB) of my own Ludwig drum-set, recorded specially therefor in professional studio. Drum samples was compiled for using with software-samplers such as Halion™, Kontakt™ , Battery2™ and NN-XT(Reason 2)™, but it is possible to use it in any sampler accepting wav files. Multichannel drum samples are not processed (no eq, no compression). Additionally enclosed “Economic” sample set contains mixed down, typically processed samples from multichannel set. I am also using it in common with other sample libraries in my drum-track productions. Sound quality of examples in this section is not as good as original because of file compression for easier online-streaming . These examples suit for demonstrational purposes only. Every drum set component (except hihat played with foot) is mapped on the keyboard as right and left hand (or foot) and assembles up to 12 velocity layers.